Lemon and blackberries are complete opposites but put the two together and they compliment each other with sweet and sour flavors. And then, you have the colors of the yellow lemon and the deep dark reddish purple of the blackberry that are showstoppers when put together. 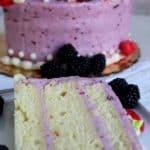 What better way to use these two flavorful fruits than with a luscious Zesty Lemon Cake filled and covered with a silky Swiss Meringue Blackberry buttercream. Truth be told, I love cake. How about you, do you have a favorite? This cake is a bit extravagant looking but is super easy to make and the flavors make this cake delightful. My birthday girl requested this cake along with a very colorful topping of fruit and piped flowers. It’s oh so pretty. Prepare to 9″ cake pans and preheat your oven to 350 degrees. Cream the softened butter and sugar, add the eggs and then the dry ingredients alternating with the wet ingredients. Pour into the pans and bake for 35 – 40 minutes. Now while your cake is baking let’s make the Swiss Meringue Buttercream. This buttercream is my favorite, it’s smooth and silky, and spreads so easily on cakes. I love, love, love it! Mmm, plump and and juicy blackberries. There are several steps to make the blackberry buttercream, trust me they are not hard. The first step is to cook the blackberries with the sugar and lemon juice. Stir and cook the blackberry mixture and add the cornstarch, cook until thick. The mixture comes out nice and thick, and yes it is red. This blackberry puree is going in the buttercream but I’m going to tell you that this sauce is perfect on ice cream, toast, pancakes, over a block of cream cheese, inside a crepe; there are so many ways to use this, it’s that good. The next step to make the Swiss meringue is to heat the egg whites and sugar. Make sure to have softened butter ready. Yes, you have to get the thermometer out because you need to cook the egg white to 120 degrees. Once you reach that magic temperature I transfer the egg whites to my Kitchen-Aid with the whip attachment. If you don’t have a stand mixer just make sure the egg whites are in a big bowl so you can beat them with your hand held mixer. Let the beating begin. For this step, you will beat the egg white until they come to room temperature. I actually put my hand on the bottom of the bowl to gauge the temperature but feel free to stick a thermometer in the bowl. Whip in the softened butter one tablespoon at a time until incorporated. While beating in the butter at one point the buttercream may look like it is separating, don’t worry, just keep beating and it will come together. Once your buttercream is ready, add 1/2 cup to 2/3 cup of the blackberry puree to the buttercream. The amount is up to you. I used 2/3 cups because the birthday girl said she wanted lots of blackberries in the frosting. Whip in the blackberry puree until combined and then you are ready to spread on your cooled cakes. Tall lemony and luscious cake; covered with sweet and silky blackberry buttercream. This is a zesty lemon layer cake filled and frosted with a Swiss meringue blackberry buttercream frosting. Rich and moist this cake really makes a statement. The cake recipe is adapted from Food & Wine. Beat in the flour mixture alternating with the milk in three batches. Pour the batter into the prepared pans and bake at 350 degrees for 35 minutes or until a toothpick inserted comes out clean. Cool cakes for 10 minutes then turn out on a cooling rack. Add sugar, 2 tablespoons of water and lemon juice. Bring the mixture to a simmer over medium heat, stirring occasionally for about 4 to 5 minutes. , Mix together the cornstarch and remaining 2 tablespoons of water. Slowly pour into the simmering blackberry mix, stirring constantly. Cook for about 2 minutes. Remove from the heat and cool completely. Place the hot mixture on a mixer fitted with the whip attachment and whip until it reaches room temperature. Add softened butter 1 cube at a time with the mixer running. Scrape down the bowl and mix until smooth. The birthday girl was very happy with her cake. Thank you for the thought on this. I go both ways on straining vs. nonstraining. It’s like we have two jars of raspberry jam in the fridge one seedless and the other full of seeds.